Significant differences in parenting create inconsistencies that send mixed signals to kids when they misbehave. Many couples take my Childproof Parenting Course or come to me for family coaching seeking ways to be more coordinated in their parenting. Inadvertently, one parent will try to counter the style of the other and this inconsistency creates stress for everyone. For example, one parent’s style is kind, loving and lenient, while the other is strict, firm and takes a “tough love” approach. Other times both parents may vacillate between both styles reacting to their children, but that typically results in parents feeling guilty, ineffective and helpless. My role is to help parents step out of these patterns to find the right blend that sets respectful boundaries for the parent-child relationship. There are three critical steps to becoming a Same Page Parenting team: 1) Define your long-term goals for your child and family 2) Prioritize near-term areas of improvement and 3) Take action. 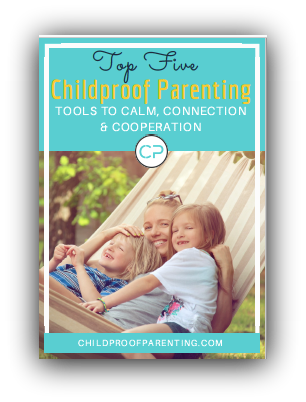 Get clear on your parenting philosophy, as well as tools and responses needed for working with your child(ren). The best place to start is to chart a vision of what it is that you are trying to achieve as a parent and what you wish for your child(ren). The process is surprisingly easy and can take as little as 5-10 minutes to answer some thought provoking questions and then sharing them with your partner. What you will likely find is that your values and goals are quite well aligned. This exercise alone will serve as an anchor that you can return to often to reestablish just how on the same page you really are and want to be. With family values and long-term goals now in place, it’s time to focus on the specific high stress situations and behaviors that are creating the most friction in the home. Yes, this might be a long list but get it out there. Include everything from bedtime struggles, to not listening, setting limits on technology, getting out the door, or even whining. Agree with your partner on what are the most urgent items to address and pick a few. Focus on really making an impact on a few issues rather than trying to boil the ocean. b) Access community resources. Take a parenting class or workshop together. Most communities have frequent events and it provides a great way to promote discussion among partners. Taking the time to have Same Page Parenting conversations early in your parenting process will be an invaluable investment in your family. Getting clear on your long-term goals as parents will set the stage for your near-term planning. Tackle two or three issues at a time so you don’t get overwhelmed and can measure progress. Take action by getting knowledgeable about resources available to equip you with the skills you will need to successful. Same Page Parenting is the journey. Knowing why and where you want to get to is the necessary roadmap. Isn’t it time you and your partner sat down to get on the same page?